A Quebec employer that rejected the job application of a former employee who was fired for absenteeism did not discriminate against him, the Quebec Court of Appeal has ruled. The Centre hospitalier universitaire de Sherbrooke (CHUS), the local hospital for the city of Sherbrooke, Que., terminated the employment of an alcoholic employee in 2001. The employee had worked for the CHUS for 16 years, but the employee’s alcoholism resulted in chronic absenteeism. The CHUS gave the employee several warnings, but the employee failed to do anything about his condition until the CHUS felt it had no choice but to dismiss him. After his termination, the former employee cleaned up his act and sought treatment. In 2005, having been sober for four years, he applied for a new job with the CHUS. However, the CHUS rejected his application without an interview because of his previous termination. The former employee filed a human rights complaint, arguing he wasn’t given equal treatment due to his alcoholism, which was a disability. The Quebec Human Rights Tribunal found there was a prima facie case of discrimination, but found the reason for his previous dismissal — too many absences — was a legitimate job qualification. The fact was, the former employee couldn’t perform the duties of his earlier position with the CHUS because of his chronic absenteeism, which breached his trust to the point where the employment relationship was irrepairable. A requirement to accommodate the former employee further would be undue hardship, particularly since the CHUS had made attempts to accommodate the former employee in the past which were unsuccessful, said the tribunal. 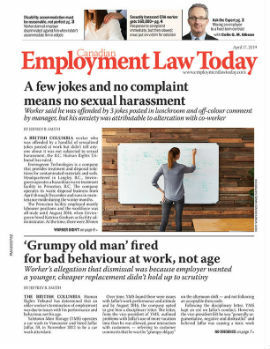 The Quebec Court of Appeal upheld the tribunal’s decision, finding good attendance was a reasonable job qualification and the former employee’s failure in this area weakened the employer’s confidence in him and was the reason — a non-discriminatory reason — for his dismissal. That same reason for dismissal was a legitimate ground for refusing the former employee’s application four years later, regardless of his new lifestyle, said the court. •Québec (Commission des droits de la personne & des droits de la jeunesse) c. Centre Hospitalier universitaire de Sherbrooke, 2012 CarswellQue 1081 (Que. C.A. ).